During the winter especially when everything is covered with snow including all of the native food and water sources for the critters that didn't migrate south to Fort Lauderdale it's a good idea to put out and maintain food and water sources. I leave my pond's fountain and waterfall flowing to maintain a source for the animals and birds to wash and drink that also leaves an area unfrozen on the waters surface. My Koi have entered into their winter slow motion "hibernation" at the bottom of the pond "sleeping" until warmer days return. This year I've been leaving out pumkins, gourds and squash in addition to the dried whole corn cobs and a mixture of different seeds and nuts for the different animals to eat. For the birds I make sure that there is a good supply of woodpecker specific suet and a wild seed mix and nuts that attracts many varieties of birds including the predatory hawks that hunt throughout the winter. 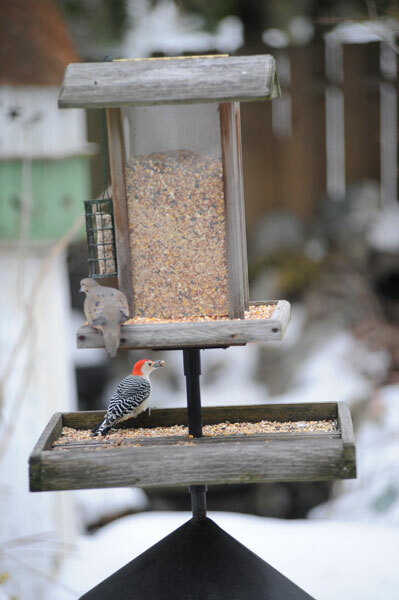 In the photo above is a Red-bellied woodpecker and a morning dove with the locally standard red/pink legs.